Three of my seed packets that I plan to use this season. 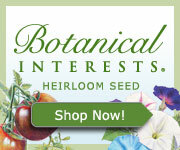 I particularly like Botanical Interests seeds due to their large selection of Certified Organic and heirloom varieties. I’ll admit it: I am a Seed Starting Newbie. I did start some seeds last year to kick off my first gardening season. However, without much prior knowledge about how to start seeds, I probably made many, many mistakes. Most of the seeds that I started indoors last spring simply did not make it, likely because I didn’t really know what I was doing. I was super excited to start my first garden last year, and I probably went a little gung-ho (okay, probably a lot, actually…). Essentially, I just forged ahead without studying up on the best methods to approach seed starting. Fortunately, I had also purchased a lot of starter plants in the spring, so I still had quite a successful garden last year despite my poor seed-starting experience. This year, I am no longer completely new to gardening, but I still have a lot to learn when it comes to starting seeds and having greater success with it. With that said, I decided to do a little bit of research this past week on the topic. To increase my knowledge, I attended a free seminar at my favorite local garden center last Saturday, and I also did some reading from a number of gardening books that I own. In case you’re like me and you need to learn some best practices for starting your seeds, the following tips should be really helpful. I know that I will now have a much greater knowledge base going into this year’s growing season, and I hope that many more of my little baby plants will live long enough to make it into my garden. These tips are not meant to be an all-inclusive class on seed starting, so I recommend that you learn as much as you can about it on your own as well. This information should be a great start for the beginner, however. 1. Buying Seeds and Seed Sources. Seeds can be purchased from individual seed companies online, through seed catalogues, or found at garden centers and home improvement stores. The newest developed varieties, rare or unusual varieties, and certified organic seed tend to be sold at higher prices. Other great sources for seeds are from friends, family members, or neighbors who have extra seeds that they saved from their garden last year, seed swap events, and from seed libraries. Although it can be very tempting to buy a large amount of different seeds, it is recommended that you do not buy more seeds than you plan to use within two to three years. Within each seed is a living plant embryo that needs to remain alive until germination occurs, so the fresher the seed, the better the chances are that the seed embryo will still be alive and will germinate. The best thing to do if you have leftover seeds from the current season is to store them in an airtight container in a cool space; a refrigerator is ideal. You can add a packet of silica gel or a teaspoon of powdered milk in a piece of facial tissue or paper towel to absorb any moisture that is present in the container. 2. Read Your Seed Packets. Seed packets contain a lot of valuable information about the growing requirements of the particular plants that you want to grow, including how long it takes the seed to germinate, the seed sowing depth, and when to start growing the seeds inside to get them ready for outdoor planting. 3. Test the Germination Rates of Your Older Seeds. If you have seeds that are more than a year old, you should perform a “germination test” to determine how viable the seeds are because they become less viable over time. Place 10 of your seeds on a moist paper towel, and place a second paper towel directly on top of your “seedy” paper towel to sandwich the seeds in between. Roll the paper towel up, place it in a plastic bag, a glass container, or a plastic container with a tight-fitting lid, and set in a warm place such as on top of your refrigerator or on top of your hot water heater. Some seeds do better germinating with more light, and some do best germinating in darker conditions, so do some research about which conditions are best for your seeds. Check your seeds every two or three days to see if they have sprouted. Once they have sprouted, determine how many actual seeds have germinated and then multiply that number by 10. That is your germination rate. A germination rate of less than 70% is a poor germination rate. You can probably still use them, but you’ll need to sow your seeds more thickly to compensate for their less-efficient germination rate. You can also use this process of pre-sprouting on your seeds to avoid some of the risks that naturally go with sprouting seeds in a soil mix, and it can also speed up the germination process. If you choose to use this seed sprouting method, be sure to transplant them right away into small pots with potting soil as soon as they have sprouted. 4. Growing Medium. It is recommended that special seed starting mixtures be used for starting seeds. These mixtures typically are made of vermiculite and peat, and do not contain any actual soil. These mixes have several advantages for seeds starting, including a sterile environment, they are free of weed seeds, and they have a texture and “porosity” that is ideal for seed germination and developing seedlings. Put whatever containers that you are using into a solid tray, fill them with the seed starting mixture, and water them before planting any seeds. The seed starting mix should settle down into the container somewhat, so you will likely need to add more mix, water again, and repeat the process until the containers are nearly full. 5. Containers. Seeds should be started in small individual containers. You can use divided containers with a single seedling/cell. If you sow many seeds in a large container, you may run into issues with roots growing into one another that can be easily injured when the plants are transplanted. “Cell flats,” plastic sheets with many small seeding compartments can be used to start seeds, as well as small individual plastic pots. Any container that you use to start seeds must have drainage holes. You can reuse plastic seed starting containers, but they should be cleaned very well prior to use or you could risk infecting your new seedlings with pathogens from the last time they were used. The seed starting containers can be easily sterilized by first washing your pots and flats in water with a mild dish detergent and then soaking the cleaned containers in a solution of 1 part bleach to 9 parts water or other disinfectant for 30 minutes and then rinsing well. Let the containers dry before you use them for your plants. Many different types of fiber pots are available for planting directly into your garden, including those made from peat, cow manure, and shredded wood. Some gardeners even make their own pots out of newspaper. These types of pots are especially useful for growing those plants with delicate roots that are easily damaged during transplanting, such as cucumbers and squash. Plastic domes that go over the seedling trays help to let light in, keep moisture from escaping, and can help to retain heat for the developing roots of the seedlings. The domes should be removed when the seedlings are tall enough to touch the top. Sphagnum moss can help to prevent fungal growth problems in your seed starting containers, due to the moss’ acidity. You can put some Sphagnum moss in between the individual rows of your seed flat to help prevent damping off. 6. Sowing your seeds for germination. The seed packet should contain directions about how best to sow the seeds that you want to plant. A good rule of thumb is to plant a seed four times as deep as its width (give enough room so that three seeds could be placed directly above it). Label which seeds you planted and where using purchased tags, wooden craft sticks, or strips from plastic jugs. Permanent marker works well when writing on the labels and will not easily wear off under wet conditions. Some seeds need light to germinate. Check the seed packet or do some research to find out if your seeds do. After sowing the seeds, cover them thinly with vermiculite. Vermiculite is porous enough to allow light through, but will help to keep your seeding medium moist, which is very important for seed germination. Some seeds need to be in the dark to germinate: Keep those seeds in dark plastic bags or keep them covered with several layers of newspaper until they germinate. If using older seeds, plant two or more seeds/cell to ensure greater germination success. Once the seedlings develop their true leaves, cut off all of the seedlings except the strongest one at the soil level with scissors. If you try to pull them apart, you are likely to damage some roots. Make sure that when sowing your seeds, your growing medium is filled to the top of the seed starting container. 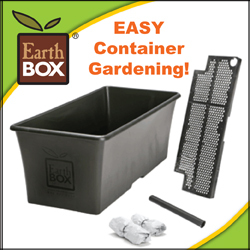 If there is a significant amount of space between the top of the growing medium and the top of the container, there will not be enough air flow getting to the seeds, and your seedlings may have problems with damping off. 7. Temperature. While most seeds that are planted in the garden need warm conditions to sprout, some seeds actually need exposure to moist, cold conditions in order to sprout. Some seeds need to go through such conditions because they have a natural dormancy protection that keeps them from sprouting during the cold winter months. As spring comes with its freeze-thaw-freeze-thaw cycles, this dormancy protection is broken down and allows the seed to germinate. Generally, if it’s a tree, shrub, or wildflower, chances are that the seeds need to be stratified. 1. In a clean plastic container, place a layer of moistened growing mix and scatter a layer of dormant seeds on top. 2. Cover with more of the moist soil mix, making sure that the layer of seeds that you are scattering is thick enough to find them when you are done with the stratification process. 3. Cover your container with a tight-fitting lid and put it in your refrigerator. Make sure that the container is well covered to prevent moisture evaporation. Different seeds need different amounts of time in the refrigerator. Do some research about the seeds you are trying to sprout, including from seed catalogs. 4. Once your seeds are sown and placed in the refrigerator, keep them in there for about a week. 5. After a week in the refrigerator, let the seeds sit out at room temperature for 1-2 days, and then put them into the freezer for another 7 days. Ideally, you would alternate between the refrigerator and the freezer a minimum of two times. Some seeds have a normal dormancy requirement plus a tough seed coat, so the warm-up period in between satisfies this requirement. 8. Keep Their Feet Warm (or The Seedling Sauna). Wouldn’t you know it, saunas aren’t just for people! Most of your germinating seedlings do best in a warm environment (approximately 70 degrees F), and an electric heating mat placed directly beneath your seedling tray will provide them with the most optimal temperature for quicker growth and the development of healthy roots. The temperature of your growing medium can actually be about five degrees cooler than a room’s air temperature, so providing that bit of extra warmth will help to keep your germinating seedlings nice and cozy. Bottom heat also helps to prevent “damping off,” when seedlings die due to pathogens that can develop at the surface of your seed starting mix. Electric heat mats are available at garden centers as well as through mail and internet suppliers. You should provide heat to your seeds and seedlings consistently until your seedlings can be transplanted into small pots. Also, don’t plug your heat mat into your lighting timer if you have one! Consistently warm temperatures are key! 9. Light. Special “grow lights” that provide specific ranges of light required for plant growth can be used to grow seedlings once they have germinated, but using standard fixtures with “cool white” fluorescent light bulbs will also give the plants adequate light and are inexpensive. If you seek a more visually-pleasing level of light where you are starting your plants, you can use a combination of cool white and daylight spectrum light bulbs. Keep the lights between 2-4 inches away from the top of the seedlings. A 2-inch distance is the most ideal. Growing seedlings need 12-16 hours of light per day, as well as a period of darkness each night for proper growth. The use of timers can be helpful to keep up with the daily light requirements of your seedlings. Lights used for your growing plants can be hung from the ceiling or ceiling beams with chains (dog chains are a great resource to use for this purpose). Adjust and raise the lights on the chains as the plants grow. 10. Water. As they develop, your seeds and developing seedlings should be misted with a spray bottle until they are transplanted into pots. Do not use a watering can to water your seedlings at this stage, as this will make conditions too wet for them and can create “damping off,” or fungal problems for your developing plants. Once you have planted the seeds in the cells, put your plastic dome on, if you are using one. The dome will help to keep the humidity in. Do not put your seed-starting tray by a window with the dome lid on, because it will make conditions too hot for the seedlings. Essentially, this will “cook” your plants. To water the seeds under the dome, lift up the dome and mist it. After your seeds germinate, remove the dome. After putting your seedlings under your grow light, continue to water them gently using a mister or water bottle. Once you transplant your seedlings to pots containing potting soil, you can start to use a watering can. Try to water them only from the bottom of the plant at this point, as water on the leaves of plants can lead to the development of fungal diseases. 11. Location, Location, Location! Windowsills are not the best place for starting seeds. They can be especially cold and drafty, particularly at night, and can have very hot temperatures during the day. This translates to too many extreme temperature fluctuations, when what seedlings actually need for development are very consistent warm temperatures. Excess heat exposure during the day can also quickly dry out the growing medium, and this can kill your seedlings. In general, the sunlight coming through a window is going to be much weaker than artificial lights that you can provide to your plants. Since the light coming in through a window comes in from the sides and not from above, your plants can develop bent stems instead of straight ones. The best conditions to start seeds are where they will be away from heavy traffic, pets, cold drafts, excessive heat, and where you don’t mind a few spills of water, fertilizer, or potting mixture every now and then. If your plants have adequate bottom heat, such as the warmth supplied by a heat mat, air temperatures above 60 degrees F work fine. Be sure to leave enough room for the seedlings as they grow. 12. Transplanting After Germination. After your seedlings have outgrown their seed-starting container, you can transplant them into pots containing regular potting soil. Some well-suited containers to transplant these seedlings into are peat or other compostable pots, since you can plant them directly into your garden’s soil when they are big enough. Alternatively, plastic cups with holes in the bottom to provide for drainage also are an option. When transplanting your seedlings, carefully scoop out the seedling’s root mass (you can use a spoon or plant tag for extra support as needed) and lift them out. Avoid holding your seedlings by the stem; they can be easily damaged. Instead, carefully hold the plant by a leaf or by the root mass, and gently transfer the seedling to its new container. 13. Getting the Timing Right. Check seed packets for the number of days until harvest to allow the plants to ripen before the first frost arrives in your area. Based upon that information, you can determine when you need to start the seeds indoors to get them ready for planting. Many long-season vegetables have to be started inside in early spring, as well as many annual flowers that will bloom during the summer. Smaller plants will typically transition more easily to the garden than larger plants will, so don’t worry about growing huge plants to transplant. Altering the temperature and water conditions can alter how fast the seedlings grow. Less water and cooler temperatures will slow down growth. Moving them to a cooler place might also give you some extra time, as much as a week in some cases. Just be careful that you don’t let your seedlings get too dry, or they could be stunted or killed. 14. Thin Your Seedlings. If you have sown more than one seed in your seed starting container (this is likely if you have sown older seeds and would like to have greater assurance of successful seed germination), you may very well end up with more than one seedling growing from the same spot. While it is great that you actually had successful germination of your seeds, only one seedling should be kept. This is because if more than one seedling grows in the same spot, they will compete with one another for resources like light, space, nutrients, and water as they grow. If you end up with more than one seedling in a spot, you should choose to keep the seedling that is growing the most vigorously, because that is the one that is the most likely to survive from that point forward. Cut off the extra seedlings at the soil level with a pair of small scissors at the ground level. Do not pull out the extra seedlings, or you risk damaging the fragile developing roots of the seedling that you do want to keep. 15. When It’s Time for your Seedlings to Play Outside. Plants started indoors will not be used to outdoor conditions (such as full wind, sun, and fluctuating temperatures), so they need a period of “hardening off” before they will do well outside all of the time. If your plants aren’t given an opportunity to get used to being outside, they could get scorched by the wind or sun, and can die. About two weeks prior to planting, move them outside for longer and longer periods every day. 1.) Put them outside for a few hours in the shade during the warmest part of the day that is protected from the wind. 2.) Leave the plants out a little longer each day, and expose them to increasing amounts of direct sunshine. 3.) At the end of two weeks, the seedlings can be planted outside in a sunny area unless there is the possibility of freezing temperatures in the forecast. 4.) Set out the seedlings in your garden once they have been hardened off. Transplant your plants during a cloudy day or late afternoon after the peak of the sun to avoid having your plants get sunburned. Row covers or other types of plant protectors can help plants by reducing wind and temperature fluctuations. If you do plant your seedlings in compostable pots, make sure that you trim the pots so that no part of the pot remains above the soil surface. Any part of the pot remaining above the soil surface could wick water away from the root zone once exposed to drying air. Cut or tear holes in the bottom of the pots to allow the plant’s roots to spread out into the surrounding garden soil. 16. Do not fertilize your seeds during germination. During the germination period, seedlings have access to all of the nutrients that they need from inside the seed itself. By giving fertilizer to germinating seedlings, you will essentially be providing them with something that they aren’t likely to use, and you run the risk of developing algae growth. Algae can thrive in the warm and moist conditions present within your seed-starting medium. Once your seeds have sprouted, the extra nutrients present in fertilizers are very helpful to your seedlings as they develop. However, do not add any fertilizer until you have transplanted your seedlings from the seed-starting container into larger containers for further growth. brown seed pods from my Sweet Basil plants. Man, that was a very long post! If you are still reading this, you are rockin' awesome! In all seriousness, I wanted to provide you a good amount of information that will hopefully help you as you get your seeds started this year. I wish you the very best in your seed starting endeavors this season! I really enjoyed your post because I have been learning this exact info lately trying to learn more and more about seed starting and what all is involved, researching, etc. And just like you, last year I didn't know all this and had poor results, but it seems to be going a lot better this year so far with learning from others that have been there and done that. Great post! Thanks so much for your positive and encouraging feedback, Laura! I'm so glad that this information has been helpful to you. I'm learning a lot about these things myself, and as I do, I love to pass along what I learn to my readers. Hopefully armed with this information, both of us will find much greater success with our seed starting endeavors this season! Feel free to check in again sometime, say hello, and you can also connect with me on Google+, Twitter, tumblr, Pinterest, and Facebook. I'd love to hear about any seed starting (or any other homesteading activity) success stories that you have!